"UNLESS AND UNTIL . . ."
God is One, Humankind is one and Religion is one - that is, all major religions are divinely inspired. Bahá’u’lláh is the latest in a line of Messengers from God - including Abraham, Krishna, Moses, Buddha, Zoroaster, Jesus, Muhammed and The Báb. The central theme of Bahá’u’lláh's Revelation is unity. Among His teachings aimed at building world unity are the abolishment of all forms of prejudice, the promotion of the equality of men and women, and the elimination of extremes of wealth and poverty. Bahá’is believe all the world’s major religions are inspired by God and share the same essential spiritual principles. All these faiths teach, for example, some version of the Golden Rule: We must treat others as we wish to be treated. Therefore, love and justice are central to all the great religions. While the basic spiritual principles of the major faiths are the same, their social teachings vary. These differences exist because the Founders of these religions delivered messages tailored to needs of humanity during different stages of its development. The progress of humanity can be compared to the growth of an individual human being. Humanity has gone through the stages of infancy and childhood. It is currently in a period of adolescence - that is, it is preparing to enter an age of maturity. At each stage in his or her life, an individual needs a different kind of teacher. Yet, the Grade 9 teacher is not superior to the Grade 1 teacher. It’s just that the capacity and needs of the Grade 9 student are far more advanced and complex than those of the Grade 1 student. Humanity’s social and spiritual needs are not quite the same as they were 2,000 or 1,400 years ago. For one thing, half the world did not know the other half existed in the days of Jesus or of Mohammed. Humanity did not yet need teachings that would help them organize their affairs in a complex globalized society. Today, humanity obviously needs such guidance. We live in an age of confusion, in which old modes of thinking and behaving are failing and new ones are emerging in their place. A loving God would not leave us without the guidance needed to navigate such an uncertain age. All the world’s major religions are, in a sense, different phases of one religion. God reveals His plan for humanity in stages, according to its capacity. Bahá’ís call this process “progressive revelation.” While each religion is unique in some ways, they are all part of the same unfolding story of humanity. Every one of the Founders of these great religions perfectly reflects or manifests the virtues of God. So, Bahá’ís refer to these Messengers as “Manifestations.” While each of the Manifestations shares this quality of perfection, each of their revelations is distinguished by a different central theme. Abraham, for example, emphasized the oneness of God - abolishing the practice of idolatry. Moses promulgated the rule of law through the Ten Commandments. Jesus stressed the importance of love and forgiveness; Mohammed, surrender to the will of God. Each of these Manifestations helped humanity to advance spiritually. Bahá’ís have the utmost respect and reverence for them all. But we also believe a new Manifestation has appeared in the Person of Bahá’u’lláh (1817-1892). Bahá’u’lláh’s revelation is distinguished by the theme of unity. His teachings foster unity in the home, in the community, in the nation and throughout the world. Bahá’u’lláh was born into a rich, influential family in 19th century Persia. Yet, He sacrificed His wealth and position in society to proclaim His message of unity. For His efforts, he was tortured, imprisoned and banished from his homeland. Yet, today, His community of some six million believers - drawn from every cultural and religious background in the world – stands as a testament to the power of His Revelation. We invite you to investigate for yourself whether Bahá’u’lláh has indeed set the foundations of unity. You can find out more about His teachings at What Bahá’ís Believe. If you have any questions about the Bahá’í Faith, you are welcome to borrow books from our library in St. John's or to attend an informal gathering called a fireside. For more information, call 709-726-6630, email us at lsastjohns@nf.aibn.com or message us on Facebook. 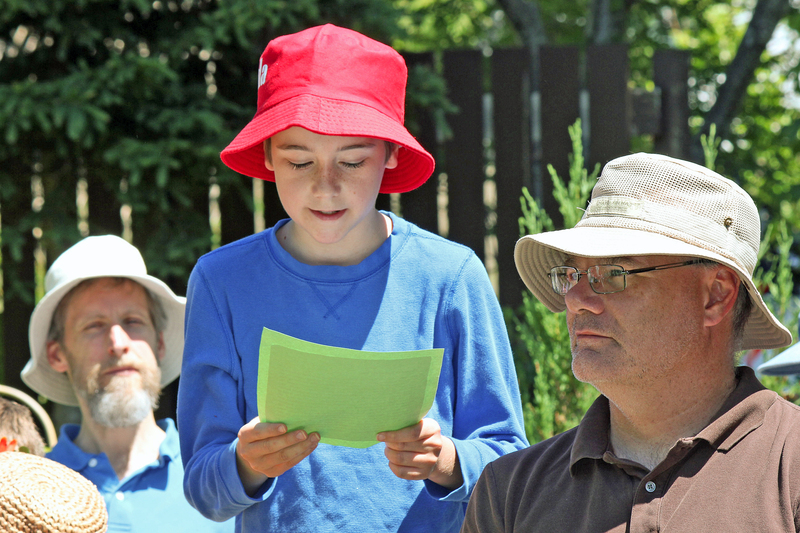 A child reads a story about The Báb at a holy day commemoration in St. John's. Bahá’í regard both The Báb and Bahá’u’lláh as the latest in a line of God's Messengers that includes Abraham, Krishna, Moses, Buddha, Zoroaster, Jesus and Muhammad.